Bond funds recorded an average gain of 3.34% for Q1. All of Lipper’s 48 fixed-income peer groups posted increases for the quarter. High Yield Funds recorded the best Q1 return among the peer groups. Bond funds recorded an average gain of 3.34% for the first quarter of 2019. All of Lipper’s 48 fixed-income peer groups posted increases for the quarter, paced by the High Yield Funds (+6.56%) classification. Among the macro-groups, General Domestic Taxable Fixed Income Funds (+4.54%) and World Fixed Income Funds (+4.01%) led the way, while Investment Grade Corporate Bond Funds (+2.90%), Municipal Debt Funds (+2.54%), and Government/Treasury Funds (+2.33%) all posted respectable gains. After losing 0.33% on average for the fourth quarter of 2018, the fortunes of fixed income funds turned around in January when the Federal Reserve reversed its stance on interest rate hikes and the reduction of its balance sheet. Federal Reserve Chairman Jerome Powell stated the Fed would be patient on its interest rate policy and would need to see a reason to raise rates (such as an increase in inflation) before doing so. This contradicted the Fed’s forecast in December, which called for two rate hikes in 2019. The Fed also announced it would stop selling the bonds it has on its balance sheet relatively soon. At the aforementioned December meeting, Powell stated that the balance sheet reduction program was on auto-pilot, and the Fed was not reviewing it for any changes. These bonds were acquired by the Fed as part of the quantitative easing program following the global financial crisis in 2008. At its mid-March meeting, the Fed confirmed it will not be raising interest rates again this year, and its balance sheet reduction program would end in September. Directly after the Fed released this information, the yield on the ten-year Treasury note closed at its lowest level in more than 14 months (2.54% on January 11, 2018). The yield on the ten-year note continued to fall (closing the quarter at 2.41%) so much that the yield curve inverted with the three-month Treasury bill (starting on March 22). The inversion held until the last day of the quarter, when the ten-year note (2.41%) posted a slightly higher yield than the three-month bill (2.40%). The inverted yield curve is of concern because it has been a reliable predictor of past recessions in the U.S. This includes the global financial crisis of 2008, which was preceded by the last three-month/ten-year spread inversion. On average, the government/Treasury funds macro-group appreciated 2.33% for Q1, which was a nice jump from its Q4 2018 performance, when it gained 0.61% on average. As evidence as to how much the fixed income funds landscape has changed over the last three months, this quarter’s performance (+2.33%) was the worst among the taxable fixed income funds macro-groups, while last quarter’s (+0.61%) was the best. In another interesting twist, the Inflation Protected Bond Funds peer group recorded the best return for Q1 (+3.11%) among the macro-group, while last quarter, it was the only peer group in the red (-1.05%). The inflation protected group also did well from a fund flows perspective in Q1, taking in slightly more than $900 million for the quarter after seeing $6.3 billion leave in Q4 2018. The Q4 net outflow was the peer group’s largest quarterly net outflows since Q4 2013 (-$13.6 billion) as investors did not seem to be discouraged by the recent round of tame inflation data. 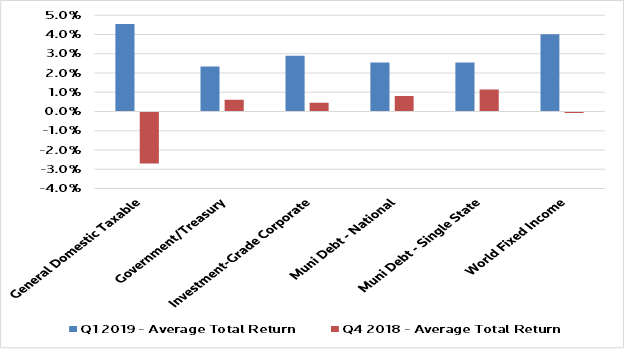 The remainder of the government/Treasury funds also posted increases for the quarter, with the longer-term maturity peer groups outperforming the shorter-term ones, and with most of the peer groups generating lower returns than they did in Q4 2018. General U.S. Treasury Funds (+3.11%) finished a close second to the Inflation Protected Bond Funds peer group this quarter, but they also had the biggest quarter-to-quarter drop in return (-0.44%) among the macro-group. General U.S. Government Funds (+2.19%), Intermediate U.S. Government Funds (+1.93%), Short-Intermediate U.S. Government Funds (1.19%), Short U.S. Government Funds (+1.00%), and Short U.S. Treasury Funds (+0.79%) were all in the black for Q1, but only Short U.S. Government Funds improved upon their Q4 performance (+0.10%). Credit spreads tightened in Q1 as the BofA Merrill Lynch US Corporate BBB Option-Adjusted Spread narrowed by 39 basis points (2.02% to 1.63%) since the start of the year. Spreads typically narrow when economic conditions are perceived to be favorable. The option-adjusted spread is considered the most useful spread when comparing bonds with different features, such as embedded options. All of the investment-grade corporate bond peer groups recorded gains for the quarter and posted better results than they did in Q4. On average, the macro-group was up 2.90% for Q1 (as opposed to 0.45% in Q4), with longer-term maturity funds outperforming shorter-term ones. Corporate Debt Funds BBB-Rated Funds (+4.91%) generated the best results within the group for Q1 after being the only peer group to lose ground (-0.40%) in Q4. Corporate Debt Funds A-Rated Funds (+4.01%) led the remainder of the peer groups, followed by Core Plus Bond Funds (+3.53%), Core Bond Funds (+3.20%), Short-Intermediate Investment Grade Debt Funds (1.95%), Short Investment Grade Debt Funds (+1.66%), and Ultra-Short Obligations Funds (+0.96%). General Domestic Taxable Fixed Income Funds went from the worst performing macro-group in Q4 (-2.70%) to the best in Q1 (+4.54%). They also had the worst performing fixed-income funds peer group for Q4 (High Yield Funds, -4.54%) and the best in Q1 (High Yield Funds, +6.56%). The flip in investor sentiment regarding High Yield Funds can be seen in the group’s fund flows results, as they had net outflows of $20.7 billion in Q4 (second worst quarterly net outflow ever), and they have taken in $12.4 billion in net new money in Q1 (third best quarterly net inflow ever). The Q1 returns for the rest of the group were as follows: Flexible Income Funds +5.91%, Multi-Sector Income Funds +4.16%, General Bond Funds +3.97%, Loan Participation Funds 3.64%, Alternative Credit Focus Funds +3.05%, U.S. Mortgage Funds +2.28%, GNMA Funds +1.96%, and Specialty Fixed Income Funds +0.14%. After three straight quarterly losses, World Income Funds bounced back in Q1, with an average gain of 4.01%. The macro-group was driven higher by the performance of the emerging market debt funds, as the Emerging Markets Hard Currency Debt Funds (+5.90%) and Emerging Markets Local Currency Debt Funds (3.20%) recorded the two best returns among the peer groups. The remainder of the group also posted positive returns, as Global Income Funds, International Income Funds, and Alternative Currency Strategies Funds were up 3.05%, 2.64%, and 1.03%, respectively. Municipal debt funds were up 2.54% overall as single-state muni funds (+2.54%) and national muni debt funds (+2.54%) contributed equally to the gains. The New York Municipal Debt Funds peer group (+3.03%) registered the highest return among the single-state muni debt funds peer group, while High Yield Municipal Debt Funds (+3.36%) led the way for the national muni debt fund classifications.